The HH66U series has been discontinued. Please see the HH802U as a possible alternative or contact our Temperature Engineering department. 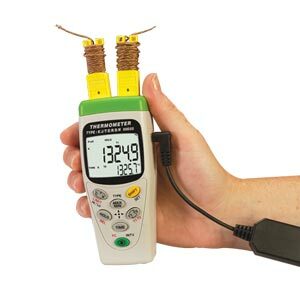 The HH66U is a portable, dual-input digital thermometer. Its pushbutton keypad, offering a wide range of functions, allows for easy onehanded operation. The HH66U comes with an USB cable and Windows-compatible software for downloading data to a PC. The minimum transmission timing setting is 1 second and the maximum is 59 minutes, 59 seconds. 참고: Comes complete with 9V battery, 2 Type K beaded wire thermocouples, operator's manual, carrying case, NIST certificate, USB cable and software.